Most work by the little-known Tilburgbased architect Stef Barenbrug (1892-1987) can be described as Amsterdam School. 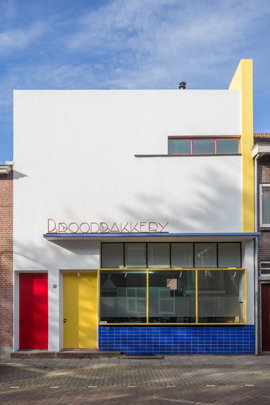 For this bakery, however, he drew instead on De Stijl. It has an abstract white-rendered facade with a blue tiled plinth, yellow and red colour accents and the lettering in modernist typography. There is an indirect link with the De Stijl movement: Antony Kok, the experimental poet who co-founded the journal, lived between 1908 and 1918 in Tuinstraat, the street where Barenbrug had his practice since the 1920s. In 1985, the bakery was painted in its original colours again and now houses a design office.